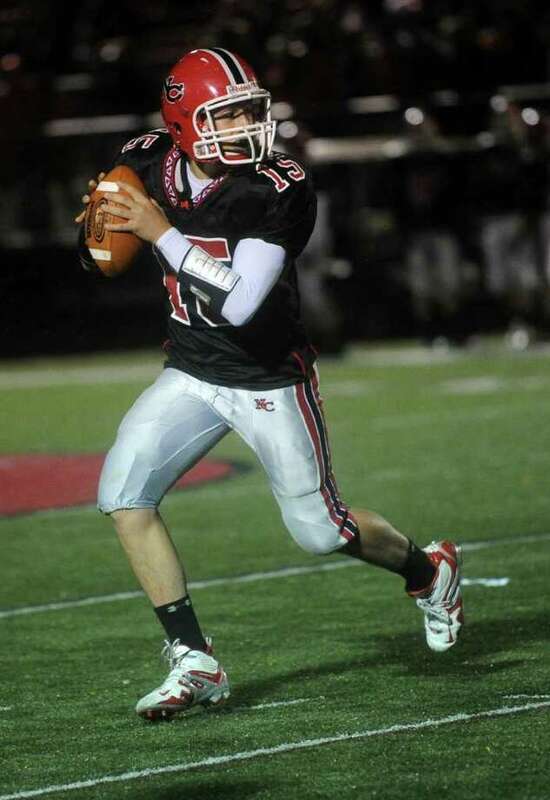 New Canaan quarterback Matt MIlano during Friday's game against Seymour at New Canaan High School on October 15, 2010. Seymour's Damien Granda is brought down during Friday's game at New Canaan High School on October 15, 2010. New Canaan quarterback Matthew Milano throws a pass during Friday's game against Seymour at New Canaan High School on October 15, 2010. Seymour's Damien Granda reaches for a ball that is passed too far out of his reach during Friday's game at New Canaan High School on October 15, 2010. Seymour's Damien Granda is tackled by New Canaan's Kevin McDonough during Friday's game at New Canaan High School on October 15, 2010. Conor Goodwin of New Canaan is brought down by Seymour's Dylan Sadick, right, during Friday's game at New Canaan High School on October 15, 2010. Seymour's Jimmy Farrell, right, reaches for an incomplete pass intended for New Canaan's Cameron Armstrong, left, during Friday's game at New Canaan High School on October 15, 2010. New Canaan's Conor Goodwin carries the ball during Friday's game against Seymour at New Canaan High School on October 15, 2010. New Canaan's Kevin McDonough is tackled during Friday's game against Seymour at New Canaan High School on October 15, 2010. Seymour's Adam Merritt, back, reaches for a ball but can't maintain control as he is tackled by New Canaan's Lucas Stopper during Friday's game at New Canaan High School on October 15, 2010. Conor Goodwin of New Canaan is tackled during Friday's game against Seymour at New Canaan High School on October 15, 2010. Cameron Armstrong of New Canaan carries the ball during Friday's game against Seymour at New Canaan High School on October 15, 2010. Seymour's Jimmy Farrell catches the ball on a punt return during Friday's game at New Canaan High School on October 15, 2010. New Canaan's Patrick Newton carries the ball during Friday's game against Seymour at New Canaan High School on October 15, 2010. Conor Goodwin of New Canaan is tackled by Seymour's Dylan Sadick, right, and Jon Wilson, bottom, during Friday's game at New Canaan High School on October 15, 2010. New Canaan's Kevin McDonough advances the ball during Friday's game against Seymour at New Canaan High School on October 15, 2010. Seymour's Luke Grabowski carries the ball during Friday's game at New Canaan High School on October 15, 2010. Seymour's Luke Grabowski, right, is tackled by New Canaan's Dylan Leeming, left, during Friday's game at New Canaan High School on October 15, 2010. Seymour's Luke Grabowski is brought down by New Canaan's Dylan Leeming during Friday's game at New Canaan High School on October 15, 2010.
during Friday's game against Seymour at New Canaan High School on October 15, 2010. New Canaan's Conor Goodwin runs the ball during Friday's game at New Canaan High School on October 15, 2010. New Canaan's Conor Goodwin is taken down by Seymour's Zach Sirowich during Friday's game at New Canaan High School on October 15, 2010.